IGS is happy to announce several new free databases on the website. All of these were produced as part of the Indiana Genealogy Digitization Project. Both of these were contributed by the Kokomo-Howard County Public Library. Each of these were contributed by the Ten O'Clock Line Chapter, Daughters of the American Revolution, Martinsville. 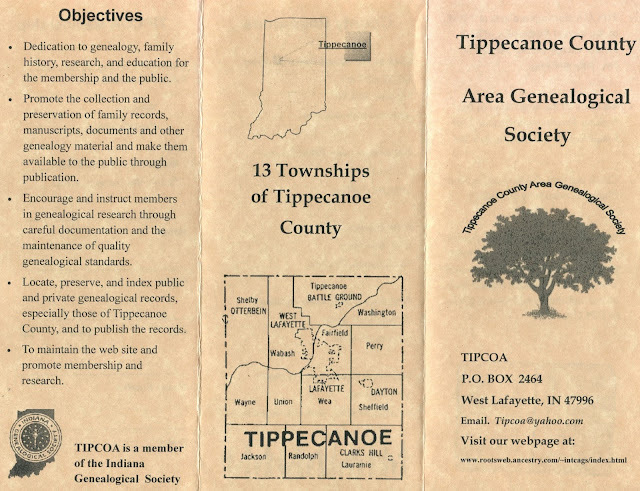 IGS' Indiana Genealogy Digitization Project provides digitization equipment to organizations with Indiana genealogy materials. In exchange for the equipment, the organizations agree to allow the images to be provided for free on the IGS website. 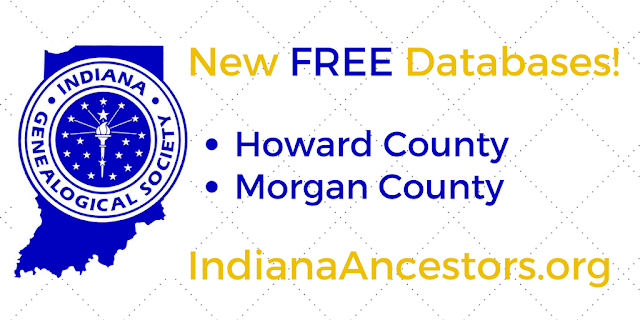 We are grateful for the Kokomo-Howard County Public Library, the Ten O'Clock Line Chapter, DAR, and all of the partners in this project for helping make more records available. 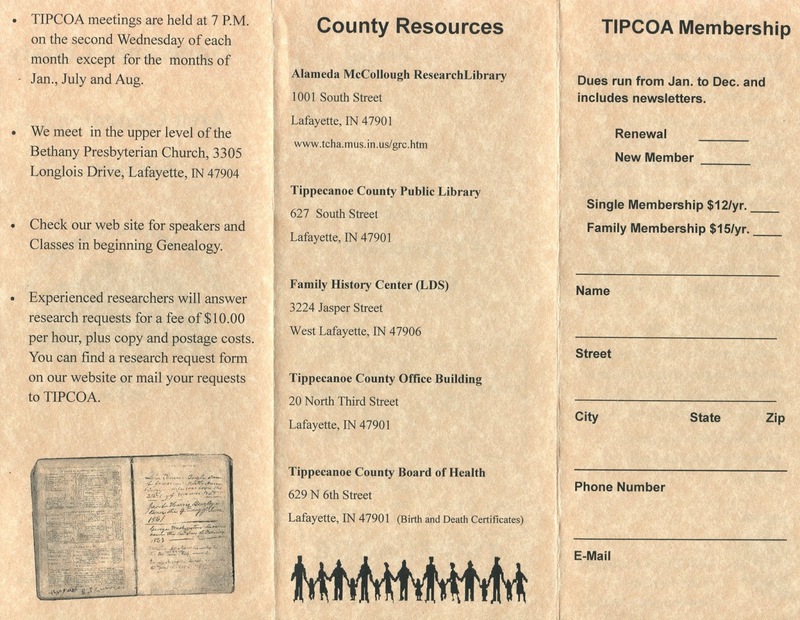 If your organization has Indiana genealogy materials that need digitizing, please consider applying for a digitization kit. My grandpa was born Sept. 9, 1885; his name was George James Shaw, which may have been given to him at the orphanage in Wabash County. He was left at orphanage a few days old; had a sister too-he was told. My mother is still alive, and I would like to find out as much as I could about my grandpa, but not sure where to look. Searching for info on Smith Turnpaugh (Turnpaw) (Turnpau). He married Mariah Naylor 7 Apr 1840, Jackson County, IN. Looking for info on his death around 1846--obit, cemetery, death cert. His son James N Turnpaugh born 6 March 1844, Jackson County, IN. birth cert, any info of his years there. We believe Smith Turnpaugh was the son of Mathias Turnpaugh (Turnpaw)(Dornbach) and Mary Smith from OH. Smith shows as Smith Turnpear on 1840 US census. Mathias shows as Turnpson on the 1840 US census. He showed up as Mathias Turnpau in Nettle Creek, Randolph Co., IN on the 1850 census. Help is much appreciated! The Indiana Genealogical Society just delivered our latest scanning kit to the Tippecanoe County Area Genealogical Society (TIPCOA). We expect great things from this active group. If you are anywhere close to Lafayette, you really need to check out the McCullough Research Library. Does your society, library, or archive have Indiana-related genealogical materials that need digitizing? Consider applying to the IGS Genealogy Digitization Project, which awards a scanner, laptop computer, and other equipment. Details are on the IGS website. I will be traveling from CO to Monticello, White County, IN, next week. My 2x great grandfather Martin Cochell enlisted shortly after Ft. Sumter in White County. Appears he was a three month recruit. His older brother Stephen Cochell enlisted later and was wounded. Would like to find as much as I can about their service while I am there. Any suggestions would be greatly appreciated. They lived on a farm in Monticello. Their father was John Cochell. Thanks for your help. The next time you are in the vicinity of Bedford, Indiana, you should drop on at the Lawrence County Museum of History. You'll be glad you did. Tell 'em IGS sent ya!